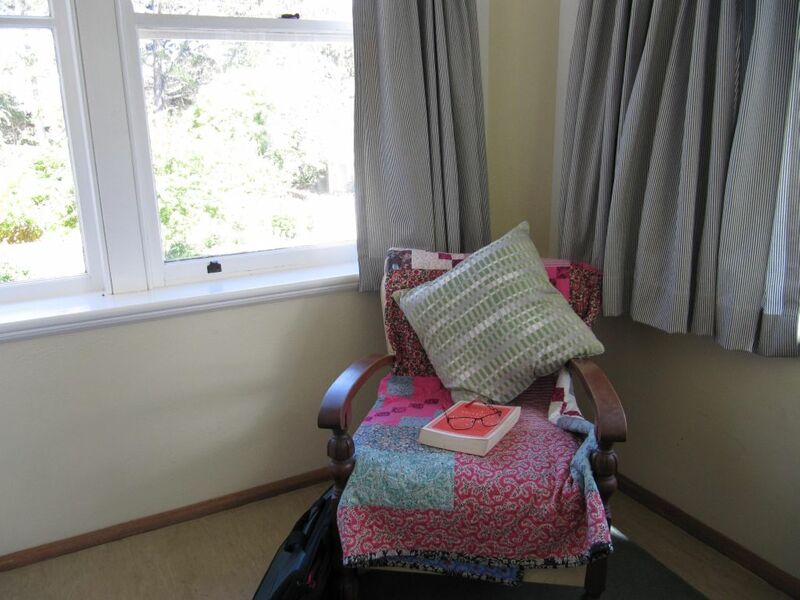 I am thrilled to be staying at Varuna Writers’ House in Katoomba, Blue Mountains. For an entire week I’m devoting all my time to writing, reading, thinking and communing with fellow writers. No shopping to do, meals to cook, house to clean, appointments to attend, kids, hubby, family to cater to, or anything to interrupt the flow of thoughts. Bliss. Bliss. Bliss. Am I spoilt? Yes – and loving it. We certainly are spoilt here. On arrival, BANG went all my ideas that maybe I’d lose a kilo or two away from easy access to my fridge. This fridge is super well stocked, as is the larder with too many yummies to mention. Sheila’s meals are scrumptious and I’m taking notes of some of her ideas. I’d better start looking at some of the healthy snack options too, before I have to send home for larger size clothes. Best of all here (not counting the absolute freedom of time to write) is the creative atmosphere. 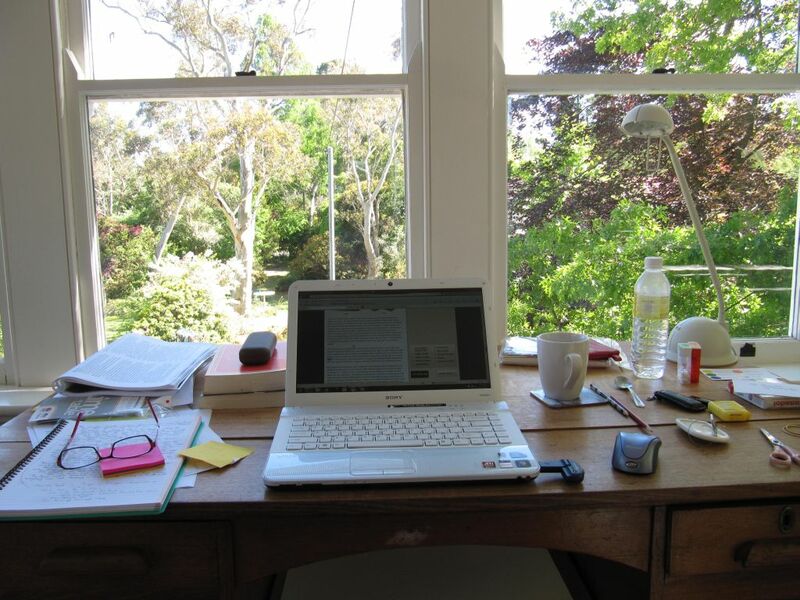 The house is so quiet during the day with all the resident writers squirrelled away in their various nooks working hard. 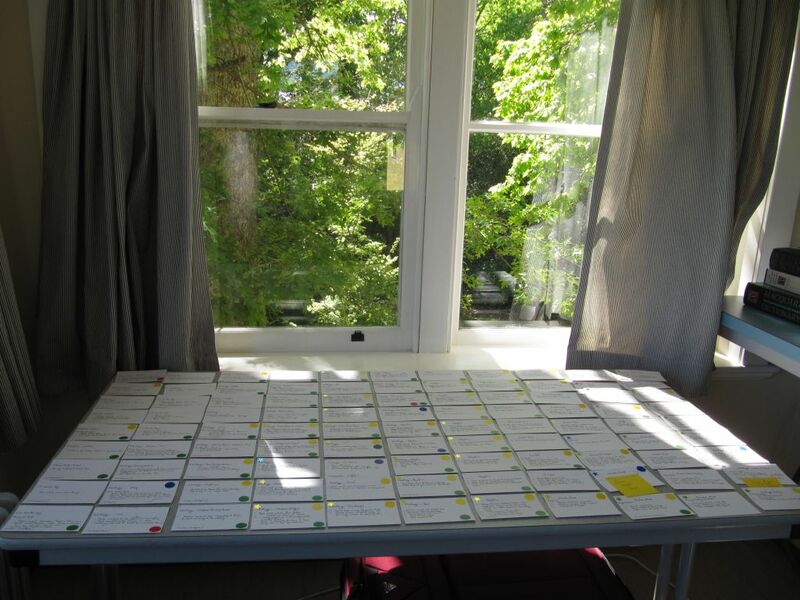 My writing space is attached to my bedroom, and wonderfully light, bright and airy. 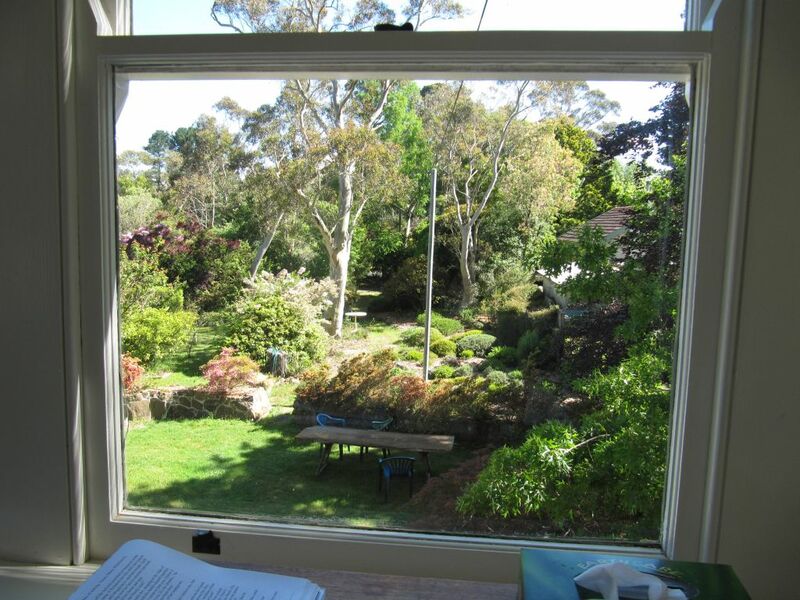 A solid desk, a reading chair under the window and the vista so superbly peaceful and open to the gardens as if nature is right there all around me. Gazing at the glorious trees, hearing the call of the birdsong chirruping nearby and out in the distance lightens my spirit and spurs my fingers to type or write. Funny how freehand seems to be more appealing in this part of the world this morning. Yesterday too, and I wrote for a couple of hours in the garden. The day was hugely productive and I added two new sections to my novel, as well as taking time to curl up in the chair reading a chapter of A History of Australia VI by C.M.H Clark. That’s another blissful bonus at Varuna. They have a fabulous library to thrill any writer. I could easily stay here indefinitely and read my way through it. Ahh, to dream. Actually no, now I’m going back to work. Only here, it seems a furphy to even call it work. That looks like heaven. I’m so glad to hear it’s going so well. And I see a plotting board. Would you like to share with us your planning strategies? Heaven it is here, Angela. You lucky girl! Love to go there some day. Hi Karen, I hope you do get to Varuna – in fact it would be great if every writer could visit at some stage. It’s a writer’s paradise. Doesn’t hurt that we’ve been blessed with perfect weather. Bonus! 🙂 C.
Oh my goodness. Peace and quiet? Sunshine? A well stocked fridge? It sounds like heaven! So glad that you’re loving it there, Chris. Thanks, Kathleen. I’m still pinching myself. 🙂 C.
Oh, you brought back so many wonderful memories to me, Chris. Varuna is a beautiful place, and so easy to slip into the writing mode. I love the ease of the slip into writing mode, Sheryl. Is it because we never really leave it here? The sheer beauty of nature is doing it for me too. 🙂 C.
So pleased for you that you are getting so much out of it. It looks and sounds like a truly wonderful place for any writer. All sounds great Chris. Brings back happy memories for me too. Very jealous of your view from your desk.